When it comes to replacing missing teeth, dental implants are often the ideal solution because they restore the entire lost tooth – roots and crowns. What many patients don’t know, is that there are a number of different materials available to create the implant posts. In this post, we’ll discuss some of the most popular implant materials to help you make an informed choice in partnership with your skilled Sunnyvale dentistry team. Dental implants can be crafted from a number of different metals. Titanium is one of the most popular and longest used options. Titanium has been utilized to repair broken bones for decades, and it has proven a successful restoration option. Patients who have allergies or sensitivities to metal may want to consider using one of the other materials. Ceramic materials can also be used to craft dental implants, and they are especially beneficial for patients who have metal allergies. Zirconia is the most frequently used ceramic implant material. Like the zirconia used for dental crowns, these implants are close to the natural looking appearance of teeth. That means that your entire implant supported replacement tooth will resemble your lost dental structures, so you don’t need to worry about the darker colored implants becoming visible and marring your smile’s natural appearance. Zirconia implants have not been used as long as titanium, but they have been successful solutions for a number of patients. Polymers, plastics, have recently been used to craft dental implant posts. 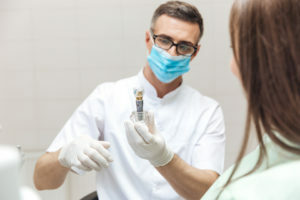 While early indications are that these implants may be effective, most dentists are waiting for more long term research results before they begin offering this option. If continued research proves successful, polymer implant posts may offer a cost-effective tooth replacement option for patients interested in implant supported restorations. Experienced Sunnyvale implant dentist, George T. Philip, DMD, is happy to offer dental implant supported tooth replacement plans using a variety of high quality materials. If you’ve lost a single tooth or a complete row of teeth, Dr. Philip and his dedicated dental team are here to help. Call our office to schedule a tooth replacement consultation today. We’ll examine your smile, review your restoration options, and partner with you to develop a plan to replace your missing teeth recreating a flawless, healthy smile. In addition to dental implant supported tooth replacement, we also provide patients a wide range of preventive, restorative, and cosmetic dentistry services to keep patients smiling.